“Leader of the Free World” is a phrase first coined during the Cold War to describe the President of the United States as the supreme leader over the world’s ‘democratic’ states. Today, America is an imperial juggernaut on the world stage, having a larger military than the next seven military’s under it combined. America is an empire whose power and scope is unmatched since the start of human civilization. Like it’s archetype, Rome, to defy America is to write your own death warrant. Unfortunately for all who oppose it, America’s power makes the empire of Rome look minuscule in comparison. In the first three centuries, Christians living in Rome were often put to death for treason because of one bold claim we are too fearful to make in America today: the ruler of empire is a false ruler. They rushed to Jason’s house in search of Paul and Silas in order to bring them out to the crowd. But when they did not find them, they dragged Jason and some other believers before the city officials, shouting: “These men who have caused trouble all over the world have now come here, and Jason has welcomed them into his house. They are all defying Caesar’s decrees, saying that there is another king, one called Jesus.” When they heard this, the crowd and the city officials were thrown into turmoil. The question is, were Paul and Silas really guilty of treason? Were they really guilty of defying Caesar? Why were the early Christians persecuted? The Gospel announcement (the “good news”), wasn’t that you could go to heaven when you die. If Paul were merely preaching about a privatized religious experience, the authorities wouldn’t care. Rome was always accepting additional religions and the worship of new gods. Instead, the Gospel announcement in the book of Acts was that there was a new emperor. This new emperor was Jesus, and this was treason. So, when the disciples began preaching the Gospel in what was the largest empire at their time, persecution and death were inevitably soon to follow. Many American Christians are completely unaware of how political Jesus really was. Though Jesus didn’t involve himself in the politics of Rome, he announced the coming of a rival nation where he was the ruler. He was announcing a revolution where there would only be one winner. This is what made Christianity a threat to empire, in the Roman empire 2,000 years ago and today in the American empire. As Christians, we are very familiar with terms like gospel, lord, savior, and peace. To most they are just religious terms but in the first century these were not unique to Christianity, they were originally political terms applied to Rome. In fact two common titles used for the Roman emperor were lord (kurios) and savior (soter). One thing that is important to understand is that the term “lord” is not a religious title, it merely means ruler, authority, or king. So, what caused early Christians to be persecuted more than anything else, was their refusal to acknowledge Caesar as ruler. Unfortunately, today when we say “Jesus is my lord and savior”, it doesn’t cause any political uproar because we are using terms that are no longer viewed as political. But, when Jesus and the early Christians stole these politically loaded terms and subverted them, applying them to Jesus and his nation, many were put to death. The Gospel of Jesus Christ doesn’t pack the same punch it did 2,000 years ago because we haven’t updated our terms to match the world we currently live in. American Christians don’t challenge the authority of America or it’s presidents. Instead, they are often vehemently supported. In this way, the Gospel today would be somewhat unrecognizable to someone from the early Church. The word “gospel” is also a subverted term stolen from Roman patriotic propaganda. Rome’s lords (rulers) were believed to have brought unprecedented peace to the world, which they referred to in Latin as the Pax Romana, or “peace of Rome.” Rome was known for securing such peace and justice through war (remind you of any other nations? ), and whenever Roman leaders returned home from another military victory, messengers were sent throughout the empire to announce the gospel (the good news) that Rome had been victorious. The gospel was the good news of victory over rival nations. The Roman empire went around conquering the world by invading nations and demanding that people confess that Caesar is lord (ruler). If you did, then you became citizens of the empire, if you didn’t you were killed. Either way, your nation would be conquered by Rome. Central to this conquest of the world was the belief that military victory is peace. There was even one line from the empire propaganda that said, “Caesar is the son of God sent to earth to bring about a universal reign of peace and prosperity.” There’s only one problem: it’s only peace if you’re the one holding the sword; to all those who were conquered by the violence of empire, it wasn’t peace. It was horrible. It was evil. The peace of empire is a demonic lie. Rome’s gospel and Christ’s gospel were at odds with each other. Likewise, America’s gospel and Christ’s gospel are at odds with each other. They are antithetical. It’s important to understand that God’s people had a different vision for the world because they believed that Jesus is ruler. They were part of a movement—a resistance movement—rooted in the conviction that the world isn’t made better through military violence, but through compassion and sacrificial love. They saw Jesus as the anti-Caesar. To them, it was better to die on a cross at the hands of the empire than perpetuate the endless cycle of violence like the Romans. They would rather die than fight for the empire or acknowledge Caesar as ruler. How many American Christians can claim the same? Some Statists will try to make the argument that Paul says in Romans 13 that human lords are to be obeyed but this isn’t the case (Paul was put to death for not obeying, read more here). Christians have always understood that “We must obey God rather than men!” (Acts 5:29). Much of the Old Testament is a protest narrative against human rulers over Israel. The last book of the Bible, Revelation, is a bit of brilliant counter-propaganda meant to bring hope to those under the boot of empire. See, beyond claiming to be just a lord and savior, Rome often claimed that their leaders were a god. Everywhere you turned in the empire were coins, flags, and monuments that proclaimed how great and powerful and good the emperor Caesar was. One Caesar, Domitian, even had a choir that followed him everywhere he went, singing, “You are worthy, our Lord and God, to receive glory and honor and power.” When he held Olympic games in the arena, he would begin by addressing the leaders of the various provinces, telling them what he thought they were doing well and what they needed to change or else he would deal with them severely. If you’re familiar with Revelation, you’ll know that John begins his letter by having Jesus address the leaders of the various churches in the region. Jesus tells them what they’re doing well and then he tells them what they need to do better. John then describes the throne of God where angels are singing, “You are worthy, our Lord and God, to receive glory and honor and power.” It should be easy to see what John is doing; he is making the bold claim that what the world claims belongs to pagan nations, in fact only belong to Jesus. Christ alone is ruler. John is taking the empire’s propaganda and slogans and subverting it. Yes, Rome often claimed that their ruler was a god, but who in America ever claims that the president is a god? Well, most Americans probably don’t, but that didn’t stop U.S. rulers (lords) from depicting George Washington as a god. 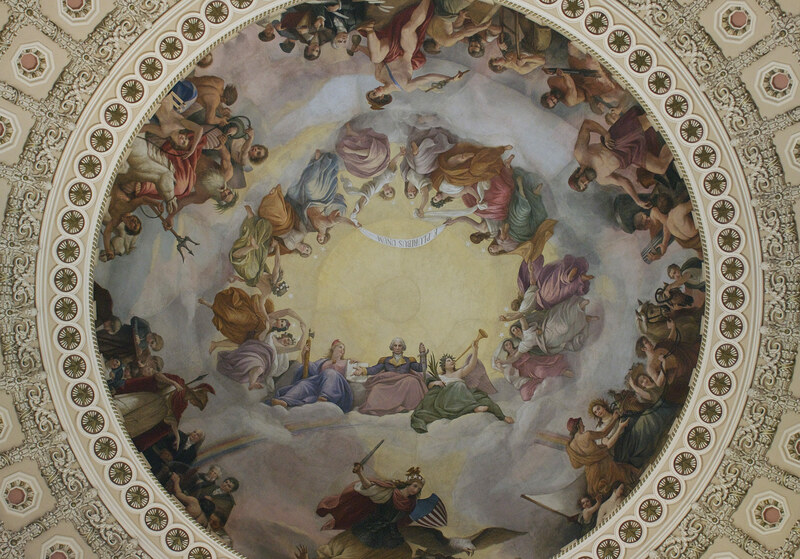 Under the dome of the U.S. Capitol building is a painting called “The Apotheosis of Washington”. Apotheosis means to elevate someone to divine status or literally to ‘make a god of’. 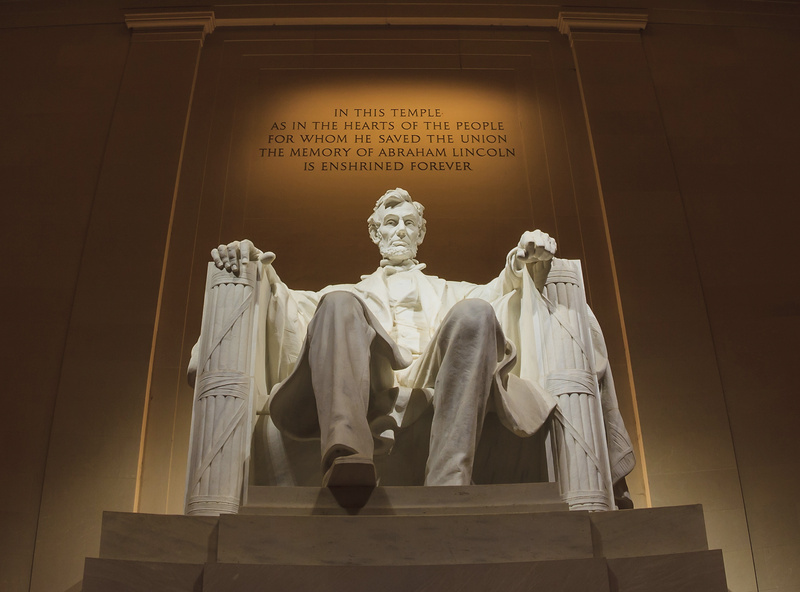 In the painting the first U.S. president is depicted as sitting in heaven, draped in royal purple, among other pagan Roman gods like Minerva, Neptune, Vulcan, Mercury and Ceres. America has a motto: in god we trust, but it doesn’t specify which god. In which god does America trust? Which Roman god? Or does America trust in Washington? No Christian god is depicted in the Capital Building. The fact is, the empire of America makes the same claim that Rome did: it’s rulers sit in the heavens as equals with the other gods and goddesses. Of course many American citizens don’t buy into the rhetoric, but even so, they will often give their total devotion and their very lives for the glory of their empire. Jesus, just as he did 2000 years ago in Rome, offers a way out of this pagan worship. Jesus brought his good news (the Gospel), that he was victorious over his enemies and that citizen of empire could be liberated. Unfortunately, when Evangelicals talk about salvation, they often speak of it as a “get out of hell free” card, but it was so much more to the early Christians. Paul described baptism as a symbol of salvation from empire. Paul even goes as far as to interpret the Old Testament in such a way that connects the exodus from Egypt to salvation in Christ (1 Corinthians 10:1-4). For them, it symbolized the exiting of empire and the entrance into the promised land: the Kingdom of Christ. When baptizing, the early Christians would enter a river on one side and exit on the other to symbolize escaping empire through the Red Sea. In America today, the Gospel has lost it’s power largely because we have stopped claiming that our Caesar has no right to power. Instead, many American Christians give their allegiance to their pagan lord and the empire they live in. American Christians have given their allegiance to their modern version of Rome and their modern version of Caesar. They have lost sight of what true salvation is, what the true Gospel is, and what true baptism is. It doesn’t matter if the lord of America is from the left or the right, they are just two sides of the same coin belonging to Caesar. The early Christians weren’t persecuted because they were practicing a new religion. They were persecuted because through their words and deeds, they had pledged allegiance to a new ruler and a new nation, apart from Caesar and Rome. The first Christians didn’t see themselves as citizens of any kingdom of the world, Rome or otherwise. They saw themselves as citizens of the Kingdom of God, the very nation that the Gospel was all about. The Gospel can be summed up in three words: “Jesus is Lord”, meaning, Caesar (any human ruler) is not. This was treason back then, and it still is today. The World is Getting Better How God's nation takes over the entire Earth.